David Ayala: "I consider myself a product of the school to prison pipeline." After spending 21 years in the criminal justice system from the age of 12, he credits his wife and God to turning his life around. His Spanish-speaking Puerto Rican mother barely knew what she was doing when she signed him over to the state at a young age without being able to properly read the official English documents. So, David Ayala was hauled off to a group home where he spent years of frustration thinking his mother had abandoned him. And the home was no place to straighten him out. "I learned more about the street than I did on the street." Because of the connections he gained there he was soon selling drugs and was arrested for the first time aged 12. "I consider myself a product of the school to prison pipeline," he says, referring to the national trend which sees many disadvantaged children who struggle in public schools and end up funneled into the juvenile and criminal justice systems. He ended up in federal prison which is where he says he grew up. "That’s where I internalized it. I realized I was only hurting myself." Under Florida law convicted felons are banned from voting in elections and can only have their rights restored completing their sentence, including probation, followed by a five to seven year waiting period and then applying under a highly sleective state 'clemency' process. Ayala found his religious faith in prison which he credits with turning his life around, along with his wife. After 21 years in the criminal justice system, he was released from prison October 6, 2006, aged 33. "From the moment I got out God started to put me in contact with the right people," he says. Just two days after his release he was hired by an LA Fitness trainer. Then he met the lady who would become his wife. "She accepted me as I was and pushed me to be better," he says. 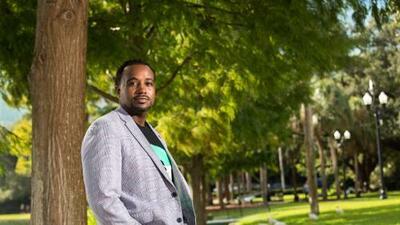 He got his GED and obtained a business administration degree from Valencia College in Orlando. A job soon followed as a Sprint business account manager. "I kept my past really quiet. I was trying to really work and put my past behind me," he said. Candi Bryan, his sales manager at Sprint, was aware of his background. "I was very happy when he was approved to come aboard," she said. "He had a great work ethic, very focused ... he was a member of our team who I could always count on," she said. He was very humble and that made him a very sober thinking person." She was sad to see him go after two years in 2016. "I understood that he had to grow professionally. I'm very proud of him for that." That changed in 2016 when his wife, Aramis Ayala, decided to run for State Attorney for the 9th Circuit, serving Orange and Osceola County in Central Florida. Her campaign, backed by billionaire philanthropist, George Soros, sought to unseat controversial then-State Attorney Jeff Ashton. When her opponent discovered her husband's criminal past he tried to use it against her. "That was a dark moment. When her opponent couldn't find anything on her and he found out that I had past convictions he released it to the news media," he said. It backfired, and Aramis Ayala won in a landslide, taking office in January 2017 as the first African American state attorney in Florida history. She is also the first women State Attorney in her circuit. Now, 44, he is the proud father of two daughters and works as a human and civil rights advocate with LatinoJustice PRLDEF in Orlando. He is currently studying for a Bachelor of Arts at the University of Central Florida with a focus on non-profit management and business administration. He reconnected with his mother in his 30s and only then began to understand how she lost custody of him. "She cried at our wedding," he recalls. All the remains for Ayala to become a complete citizen is the restoration of his voting rights, he says, noting that he was not able to vote for his wife when she was elected. “I have finished my probation, I have paid of all my fines, and there is no reason why I shouldn't be eligible to vote,” he says. He is not eligible to seek clemency until next year, but says he doubts he would have much chance despite his exemplary behavior since leaving prison. That's partly because his wife announced last year she would not seek capital punishment in any case, causing Governor Rick Scott to reassign potential death penalty cases to another State Attorney. She filed lawsuits disputing this action in the Florida Supreme Court of Florida, but lost. "I don’t think I’d ever have a chance of applying in Florida," he said. "I can just imagine if I go up before Scott what he would say to me." Scott will step down as governor in January, and if Amendment Four passes he won't have to seek clemency and would be declared automatically eligible.